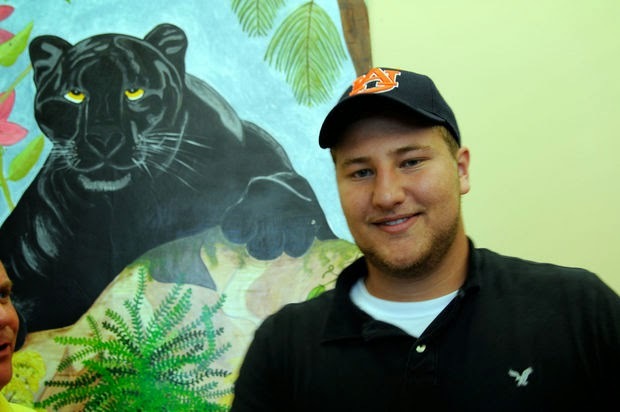 Shirts With Random Triangles: Auburn lands four-star offensive guard prospect Tyler Carr for its 2015 recruiting class. Here are Carr's 247Sports.com composite intangibles. Carr is a rated as a four-star offensive guard. He is ranked as the tenth-ranked OG prospect for 2015. He is ranked sixth among prospects in the state of Alabama, and at 225 among all 2015 prospects in the U.S.
Carr is also ranked 286th in the ESPN 300 for 2015. Carr attends Southside High School in Gadsden, Al. He stands 6'5", and weighs 311 lbs. Carr was part of a one-two punch for Auburn on Tuesday. Auburn also received the commitment of Montgomery, Al. HS rising senior tight end Jalen Harris. The two state of Alabama players increase the size of Auburn's 2015 recruiting class to 17.